As we know by default refiner cut off max bucket size is 1000. So what if some time we as the developer wanted to increase it or having a requirement where we have more than 1000 refiners values. In this scenario, if you want to increase the size of the refiner you need to update the managed property by using the following powershell command. Full PowerShell code download from Github gist. 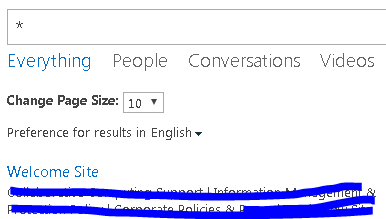 After done with the above changes you will face one more issue in IE, i.e. when you click the search vertical, Unfortunately, init.js throws an exception in this context (as it tries to access window.frameElement, which belongs to the other domain). MSDN mentioned same issue. We have a requirement to send email vai SharePoint Rest API. We dig and find the below solution to send email using SharePoint API. In OOB control template there is only 10 results per result able to view to the end user. The functionality would be handy if we provide such type of end user to change the result size itself. So the idea just place on drop-down at the top of the search result, when user changes the drop down it will change the size of the page. Following are the steps to implement drop down in Control Search results.